2. That I allowed it to sit on my bookshelf for so long! When going into When We Collided I was expected a contemporary teen love story. Never did I expect the beauty that would leap off these pages in magical colours. 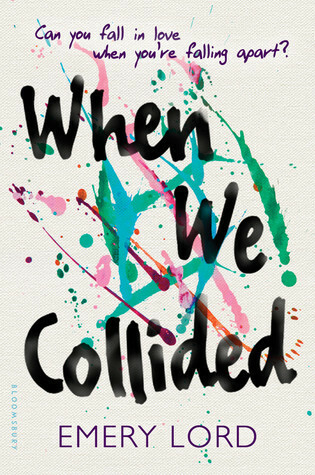 Emery Lord created a real novel within the pages of When We Collided. Vivi was such a vibrant character. A girl that danced to her own drum, that she probably bedazzled with glitter and glow-in-the-dark paint. She was so bright on the outside, but had something dark gripping it's fingers around her on the inside. Jonah had so much depth. He may seem like your average teenage boy on the surface, but he too has seen a side of darkness that no child should have to every deal with. Jonah has a burning fire inside of him though and that jumps off the pages as both characters unfold. And then BOOM! Vivi and Jonah collide. And it is this beautiful, cosmic, stardust story. Vivi the firecracker and Jonah the flame. Emery Lord crafted such fervent story. Told desperately from both Vivi and Jonah's perspectives. I read this book just as so, desperately and intense. I couldn't put it down or peel my eyes away. It curled it's beautiful fingers around my heart and reeled me in! When We Collided tackles grief and mental illness in such an elegant way. And while these two beautiful teenagers are dealing with their own demons, it is all wrapped up in a beautiful, hilarious package. I know, I know! But When We Collided is one of the most quotable books I have read in a very long time, and their were moments that I didn't have a shred of anything near to bookmark pages, and because they were so good, I had to do it. I dog-eared the pages!